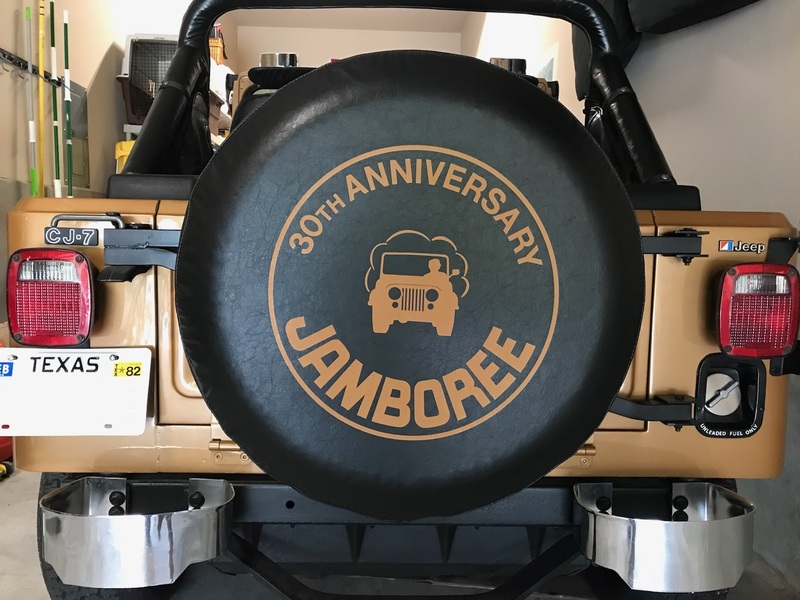 The Jambo came with a specially designed and matching spare tire cover. 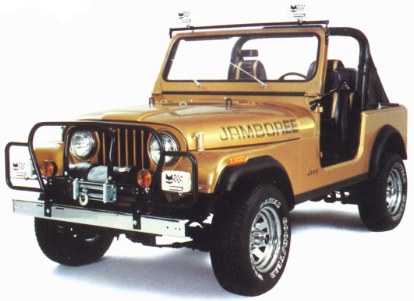 Notice that the color was supposed to match the body color (Topaz Gold Metallic); White Jambos still had a gold imprint tire cover. The cover only fit the small polyspare. 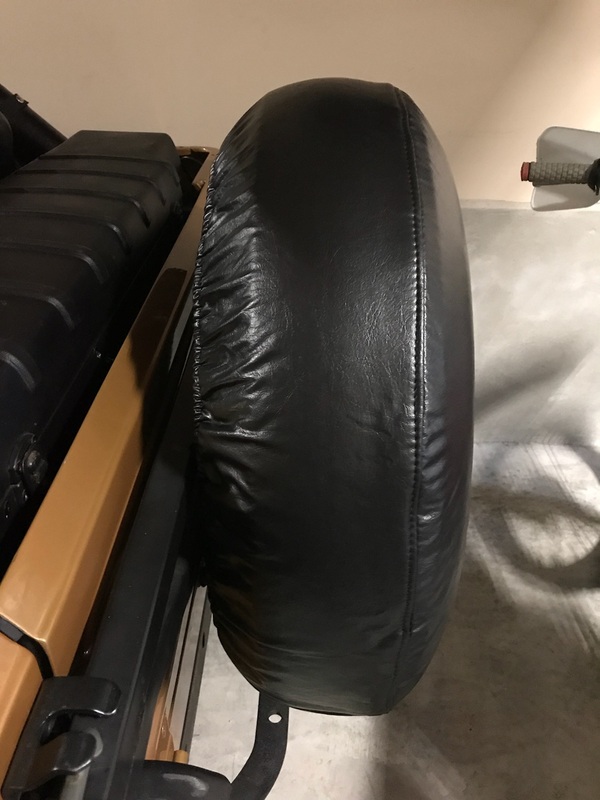 For this reason, most owners tossed the tire cover in favor of a larger cover to fit their full-size spare. The tire cover is nearly impossible to find today. However, The Jambo Registry did have a limited run of reproductions made. You can find out more here. 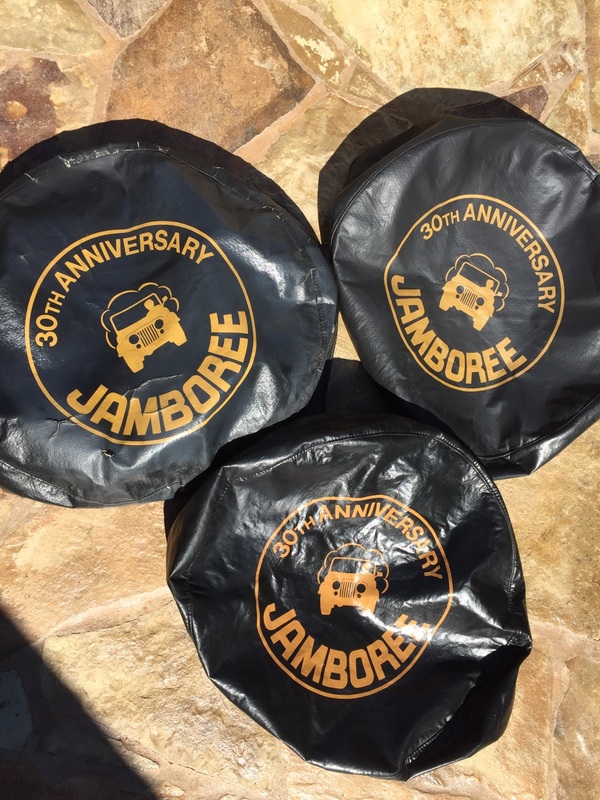 The Jambo came with a specially designed tire cover that fit the small (P225/75D15) polyspare. Today, the tire cover is probably the hardest Jambo item to come by. 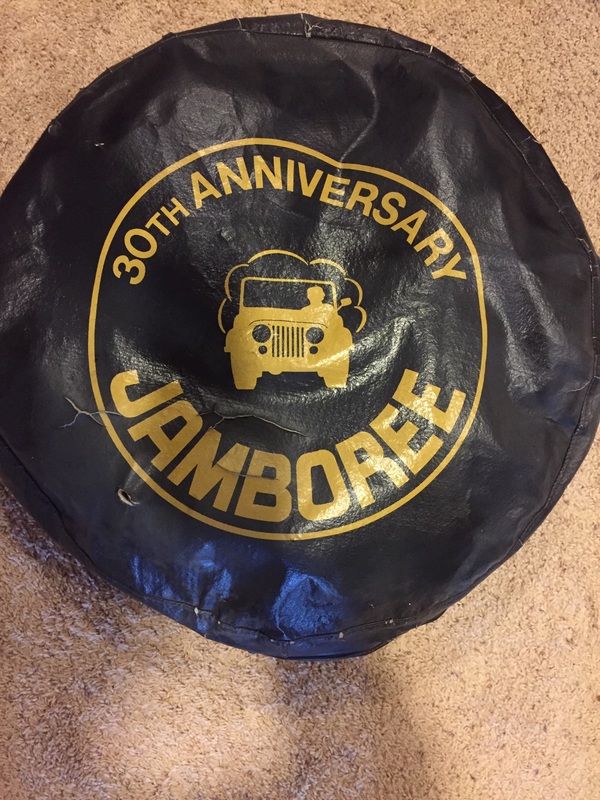 Some guys will buy an entire Jambo just to get the tire cover! Just what color the original tire covers were is an interesting question. 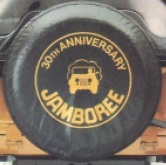 Here is a picture of an original tire cover that was used on the Jambo. Notice that printing looks yellow to gold in color. This makes some sense because the Jambo was gold. However, it was TOPAZ Gold Metallic, not gold. Below, on the left, is a picture of a Jambo tire cover that was never used! It has much more of an orange hue. On the right, is that same tire cover installed on Jambo #0152, which was repainted Topaz Gold Metallic. Though this Jambo has been repainted, it was carefully repainted to reproduce the original color as closely as possible (you can read more about that here). 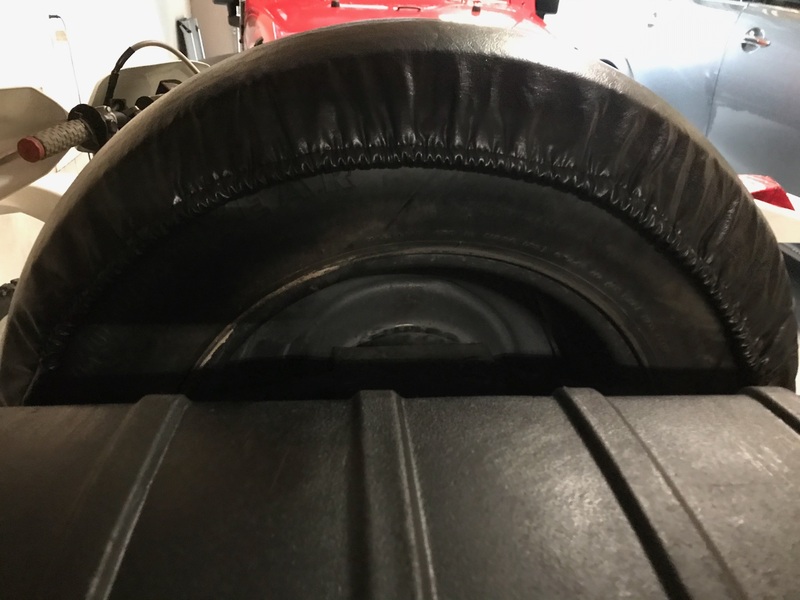 Here is a comparison of the original Jambo tire cover (bottom-center) to two old Jambo tire covers. The color difference is stark. The Jambo tire covers we see today are clearly faded! Originally, they were much closer to an orange-gold color--much closer to Topaz Gold than straight Gold. 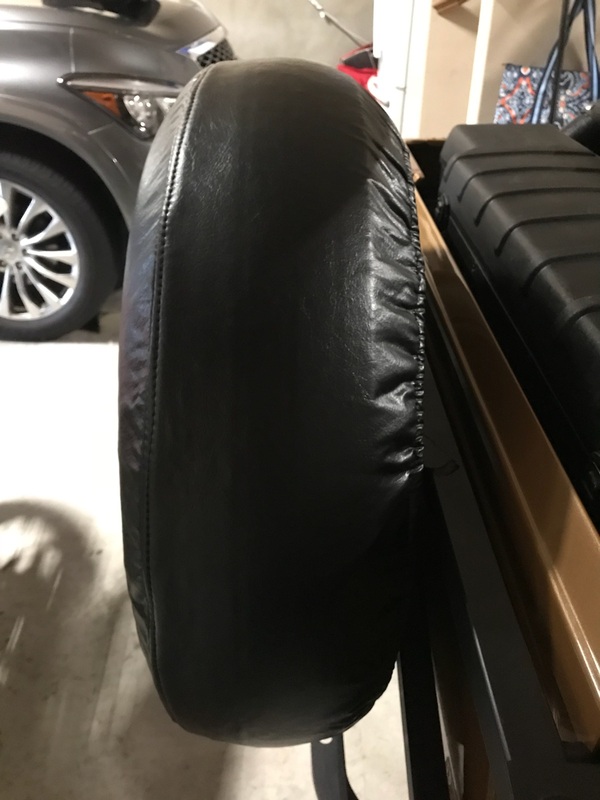 Color: As discussed above, old tire covers are very faded and the ink looks yellow or light gold. It is supposed to have much more of an orange-ish tint. The fact that the original cover looks so different than the old faded ones was not known until about a year ago and a previous reproduction cover was produced that was the wrong color. In addition, these reproductions are silkscreened, just like the original. They don't use cheap iron on vinyl lettering. Fabric: We used black crush material just like the original cover. 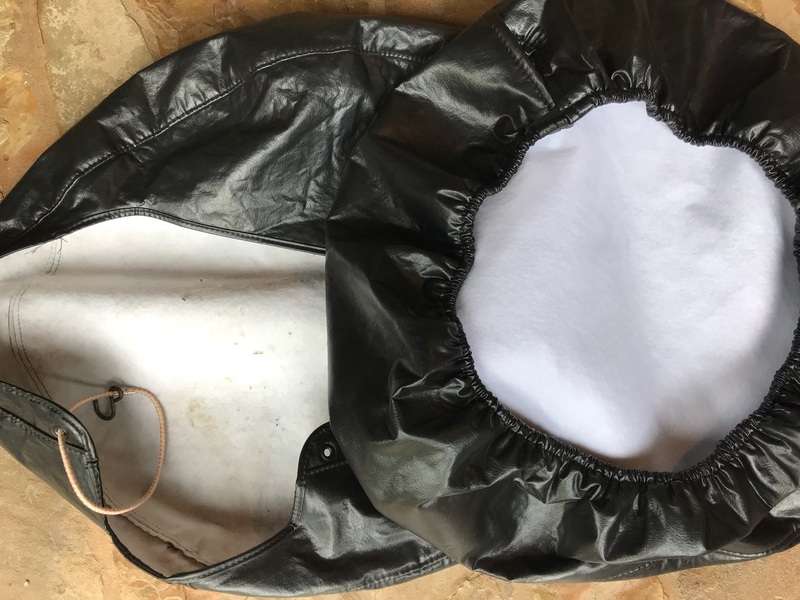 This fabric also has the white fabric on the inside, just like the original, unlike cheap tire covers you can buy today. Below is a comparison of an original NOS (P225/75D15) cover on the left to a 28" reproduction cover on the right. They are nearly identical. The reproduction covers look awesome! The graphic even includes "mistakes" that were included in the original. For example, look at the headlights on the original cover. The left one intrudes into the grille, just like on a CJ. However, the right one does not. We did not fix this on the reproduction cover. The fit is outstanding! The look is incredible! You're welcome! You can tell the difference between the original and the new covers because (1) the new material is thicker and better quality than the orginal and (2) the backside of the cover is not the same and it fastens with a built in elastic band rather than a external one that you had with the old ones. Sorry, we don't support larger tire sizes; there is not enough demand. 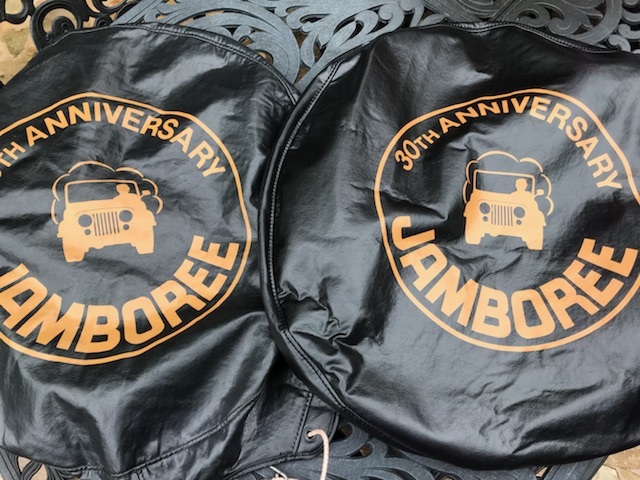 If you want a reproduction tire cover, please email The Jambo Registry (jambo152@82jambo.com).